Anastasia Lin, a gifted actress, is also the reigning Miss World Canada. She entered the beauty pageant in order to call attention to ghastly human-rights abuses in China. THIS WEEK, two extraordinary Canadian films — one a chilling documentary, the other a riveting drama based on its findings — were released for sale on iTunes. Directed by Leon Lee, the films illuminate what may be the most depraved of all systematic human-rights atrocities in the world today: China's industrial-scale harvesting of vital organs from prisoners of conscience, to be transplanted into patients paying exorbitant fees for a heart, kidney, or liver made available on demand. The documentary, "Human Harvest," won the coveted Peabody Award for its exposé of an unspeakable crime against humanity. In 1999, Chinese hospitals began performing more than 10,000 organ transplants annually, generating a vast and lucrative traffic in "transplant tourists," who flocked to China on the assurance that they could obtain lifesaving organs without having to languish on a waiting list. China had no voluntary organ-donation system to speak of, yet suddenly it was providing tens of thousands of freshly-harvested organs to patients with ready cash or high-placed connections. How was that possible? The evidence, assembled by human-rights researchers and investigative journalists, added up to something unimaginable: China was killing enormous numbers of imprisoned men and women by strapping them down to operating tables, still conscious, and forcibly extracting their organs — and then delivering those organs to the hospital transplant centers that have become a major source of revenue. Chinese officials claim that organs come from violent criminals on death row. But "Human Harvest" makes it clear that most of those killed are peaceful citizens persecuted for their beliefs: Tibetans, Uighurs, Christians — and, above all, practitioners of Falun Gong, a Buddhist-style spiritual movement of peaceful meditation and ethical commitment. Falun Gong (or Falun Dafa), a peaceful and nonpolitical discipline, attracted millions of adherents across China during the 1990s. But in 1999, Jiang Zeming and the Chinese Communist Party, alarmed by the popularity of a belief system not controlled by the state, abruptly turned against it. Practitioners found themselves demonized as dangerous cultists; by the hundreds of thousands they were arrested and imprisoned, often subjected to ghastly torture until they "transformed" — i.e., until they signed a document renouncing Falun Gong. Many who wouldn't died under the knife, literally butchered for their organs. As awareness of China's gruesome organ-harvesting crimes has spread, a few Western governments have moved to combat it through laws forbidding citizens from traveling to China for transplants or barring insurance companies from covering it. In conferences and parliamentary hearings, activists have pressed for a comprehensive strategy to end to organ harvesting. But the best vehicle to arouse a massive audience to resist China's massive evil is popular culture. Hence Lee's newest movie: a feature-length thriller, "The Bleeding Edge." The film stars Anastasia Lin, a gifted Chinese-Canadian actress who also happens to be the reigning Miss World Canada. She plays Chen Jing, a young Falun Gong practitioner who is jailed and brutally tortured for her refusal to "transform." A simultaneous plot line follows James Branton (played by Jay Clift), a hard-charging tech entrepreneur whose heart collapses while on a business trip to China to close a major deal with the government. Branton receives an emergency transplant that saves his life — and motivates him to find out how a suitable organ could have been located so quickly. Lin drew international headlines last year when she was declared persona non grata by the regime in Beijing and denied a visa to enter China, where the 2015 Miss World pageant was being held. For Lin, who was born and lived in China until she was 13, beauty pageants are a means of calling attention to human-rights abuses in her native land, and the government was intent on denying her a Chinese platform from which to speak. This year's Miss World pageant is taking place in Washington, DC. Lin is once again representing Canada. The competition's motto is "Beauty with a Purpose," and Lin's purpose hasn't wavered: to shed light on China's terrible repression, particularly its inhuman treatment of those who practice Falun Gong. "The Bleeding Edge" will be screened in Washington a few days before the Miss World final on Dec. 18, and the iTunes listing is timed to coincide with the Lin's bid for the crown. Far better, of course, would be a wide theatrical release, but no theater chain has agreed to show the movie. That isn't because of any problem with the quality of the film — it is a gripping work, and Lin's performance is haunting. But China's regime exerts enormous leverage on the US movie industry. Studios are afraid to make films that may face resistance in the Chinese market, and major swaths of the American theater market, such as AMC Entertainment, are wholly-owned subsidiaries of Chinese conglomerates. When Beijing aims to stifle a message, it takes ferocious courage to push back. Lin's father, who still lives in China, was threatened by security agents into severing his ties with a daughter he adores. A renowned Canadian fashion designer who was eager to provide dresses for Lin's Miss World appearances abruptly backed out after allegedly receiving a warning from the Chinese embassy in Ottawa. And Lin, who has pursued film acting as a career since she was 16, has been told more than once that she is effectively blacklisted in Hollywood. 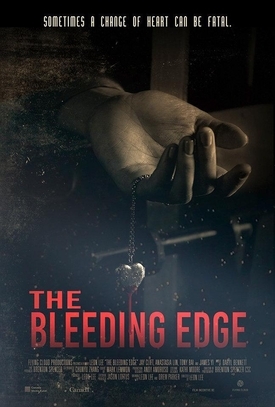 Making any film is challenging, but "The Bleeding Edge" has had to contend with the unique roadblocks that come with Chinese enmity. Chinese-speaking cast and crew members who were supposed to work with Lee backed out for fear of endangering loved ones in China. Owners of venues where filming was to take place panicked when they heard actors rehearsing their lines. One potential distributor told Lee: "I am not keen on putting my head in China's crosshairs. . . . I really wish I could publicly attach my name to this, but too many of my paychecks are involved in Chinese funds." Yet Leon Lee and Anastasia Lin have not lost their resolve. Nor have they lost sight of their goal, which is not fame or fortune for themselves, but liberty for China's people and an end to an ongoing crime against humanity so evil that Josef Mengele could have devised it. China want to quash "The Bleeding Edge." All the more reason to view it.